Despite my numerous travels around South Africa and general affinity for mountains, I somehow managed to miss out on visiting the country's tallest range until recently. I mean, the Drakensberg mountains were even declared (by Hollywood) to be the ones that would survive the end of the world! How could I not have seen them? For those of you who do not remember, or did not watch, the final scenes of the film 2012 and have no idea what I am on about, please let me explain. The Drakensberg ('dragon mountain' in Afrikaans) is home to the entire top ten of the country's tallest mountains, winds through multiple provinces and forms the border between South Africa and its landlocked neighbouring kingdom, Lesotho. Part of the area comprises the Maloti-Drakensberg Park, which was named a UNESCO World Heritage Site for its environmental, historical and cultural importance, as it is home to everything from hundreds of rock art sites to endangered animal species. The Drakensberg is a popular escape for those looking for everything from a casual camping weekend away to a multi-star luxury resort, with long winding hikes and time spent with nature forming some of the main attractions for the city folk. 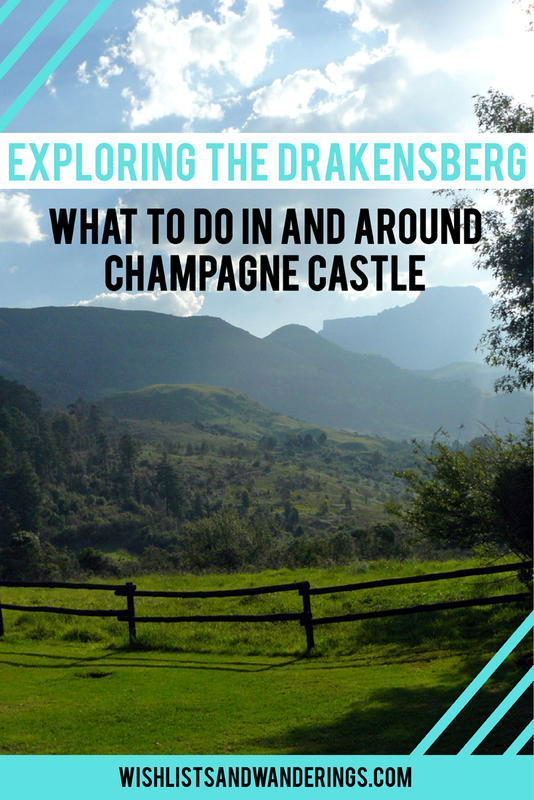 Given the sheer size and span of the range, it would probably be easier to walk its length than put together an all-encompassing 'what to do in the Drakensberg' guide. Okay, I'm exaggerating. It would definitely not be easier to walk it (unless by 'walk' you mean 'amble slowly for the next thousand years before giving up and eating an ice cream instead'). To save me the exertion and to save you the trouble of a book-length article, I'm going to focus on the region around Champagne Castle - one of the tallest mountains in the range. At 3377 metres above sea level, it's a good place to start. Nestled in between maize fields, rolling hills and the occasional sheep, the road to Champagne Castle may lead you to believe you're off to exactly the middle of nowhere. 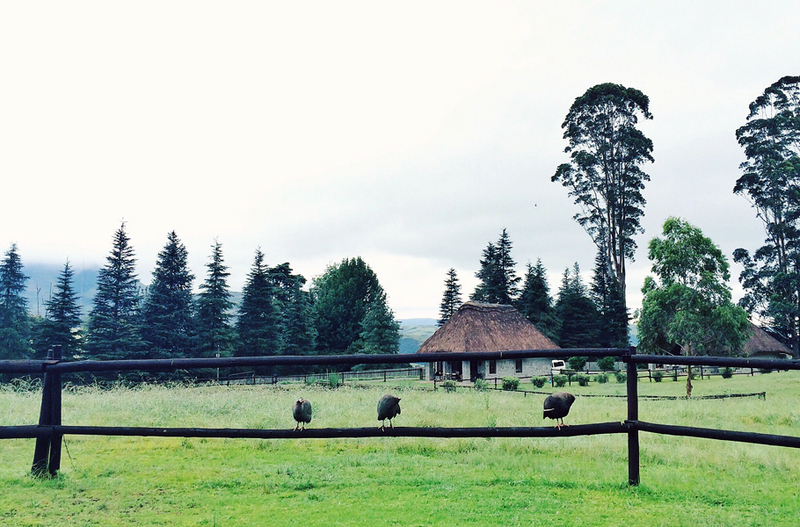 If you take a less direct but more scenic route to the area from Durban, you can spend some time in the Midlands Meander, home to mountain biking and horse riding routes, coffee shops and the site Nelson Mandela was captured by police in 1962, before heading towards the peak itself. On the way, you'll spot the town of Winterton, signaling the beginning of Champagne Valley. In between large stretches of open road, you'll find craft and curio shops, a golf course and even a highly recommended waffle restaurant, before beginning the climb towards the mountains. Champagne Castle is a relatively castle-shaped mountain near the border with Lesotho. This so-close-but-so-far proximity to another country is quite unfair, but you really can't just pop next door for a day trip unless you'd like to climb over the actual mountains, apparently. The peak originally acquired the name after a porter dropped a bottle of bubbly at the top, preventing the hikers from having their celebratory toast and forever bestowing the mountain with the name 'Champagne Castle'. Today, the area is dotted with a number of guest farms, cottages, resorts and campgrounds, which host travellers keen to explore what the valley has to offer. While many visitors are quite content to lie by the hotel pool all day, there is much more to do in Champagne Valley than you'd expect. There are standard outdoorsy options (horse riding, golf, bowls, tennis) along with less-standard outdoorsy options (white water rafting, quad biking) and non-outdoorsy options (craft stalls, choir concerts and coffee shops). In between all that, you can attend daily shows at the Falcon Ridge bird of prey centre or check in to the spa at Champagne Castle Hotel for a pedicure or a massage (the Hotel also has a small animal farm, if you are a fan of fluffy bunnies). But one of my favourite things to do was to just observe the fields and forests. The amount of birds and wildlife you can spot on a short walk in the area is incredible. From guinea fowl and Egyptian geese to magnificent long-tailed creatures who drift gracefully on the wind to birds of prey with soaring wingspans, a keen set of eyes can see a lot. Of course, you can't leave without testing out your hiking skills. While I am apparently more accustomed to 'walks' rather than 'hikes' (seriously, some of the routes were not to be tackled in running shoes more accustomed to jogs on urban streets), there are a range of options for visitors. If you're just interested in a short 30 minute walk to a dam or river, you'll be fine. Looking for a 18 hour mega hike to the top of Champagne Castle itself? That's an option too... just watch out for the snakes. Whatever your interests, the Champagne Valley seems to cater to your needs. Somehow, this region so far from any kind of urban entertainment still has so much to offer. I hope I'll be able to make another trip to explore some more... and maybe get to Lesotho next time, too.